Located adjacent to Centennial Olympic Park and the exciting Georgia Aquarium, The Georgia World Congress Center is a fun and lucrative facility to promote your business while in Atlanta. You can make a splash with our selection of trade show displays and exhibition solutions, and then unwind with the bustling music and nightlife scene in the area. Where is the Atlanta Convention Center Located? The Georgia World Congress Center is located at 285 Andrew Young International Boulevard NW, Atlanta, GA 30313. It hosts more than a million visitors a year, and is the third largest convention center in the country! Attending a trade show as a business comes with countless benefits. By simply appearing at an event, your company gains exposure from potential clients and customers. Businesses often seem more legitimate and trustworthy by attending such events. Perhaps the only downside to visiting a trade show involves the cost. To attend an event, you'll need to create marketing and display materials as well as train someone to present the company. Nothing looks worse than a table with a tri-fold display standing on it. 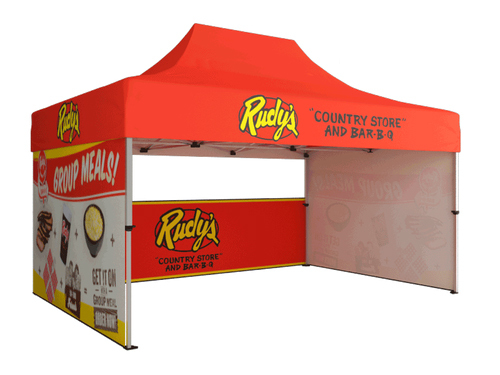 By opting for a trade show display, you'll see better results at your next trade show. A 10x10 display combined with other display features looks incredible. Visitors to your booth will walk up to your booth and want to learn more about your company. Our trade show displays can be customized to display a static image or to cycle through images like a presentation. When your company attends a trade show, you'll want to achieve specific goals. This could involve finding new clients, closing sales, or even making new business connections. You'll see the best results here by putting your company forth in the best light possible. Therefore, your trade show display should tell visitors everything they need to know about your company and why it beats the competition, all within a few seconds.